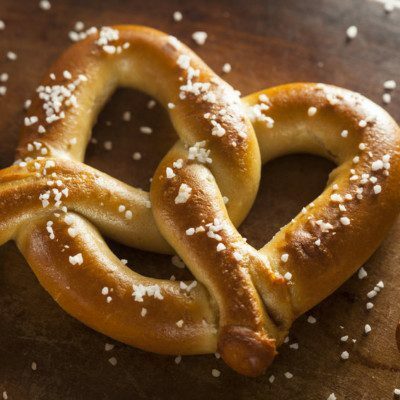 Lye or caustic soda is commonly used for dipping pretzels. Lye, or caustic soda, is a mixture of sodium hydroxide and water. This strong alkaline compound is used sparingly in baking due its dominate properties. While stronger solutions of lye have been made famous for making soap and other cleaners, food-grade lye is a much milder solution. It is commonly used as a preservative or softening agent. Lye’s discovery and first uses revolved around soap. The ancient Babylonians and Romans are believed to accidentally discovered the cleaning properties of lye. Archaeological excavations have found soap used in Babylon from 2800 B.C., when animal fat and cooking ash mixed in water and made lye-based soaps. Toward the end of B.C., Romans discovered a lye solution when rain, volcanic ash, and animal fat from sacrifices mixed in a river, which became a place of cleaning. Nicolas LeBlanc, a French chemist, synthesized the first sodium hydroxide solution in 1780. Lye is a stronger alkaline than baking soda or sodium bicarbonate, with a pH reading ranging from around 13 to 14.2 Its base of sodium hydroxide is created commercially by the electrolysis of sodium chloride solution, as well as reacting calcium hydroxide with sodium carbonate, according to the FDA. The empirical formula for lye is NaOH. Sodium Hydroxide, in its many forms, is recognized by the FDA as GRAS for its uses as a pH control agent and it can be added to food following GMP guidelines. Das, D.j., and S.a. Barringer. “Potassium Hydroxide Replacement For Lye (Sodium Hydroxide) In Tomato Peeling.” Journal of Food Processing and Preservation 30.1 (2006): 15-19. Web. Feiden, P., H.-P. Cheng, J. Leygnier, Ph. Cahuzac, and C. Bréchignac. “Stability and Structure of Cationic Sodium Hydroxide Clusters.”Chemical Physics Letters 425.4-6 (2006): 283-88. Web.